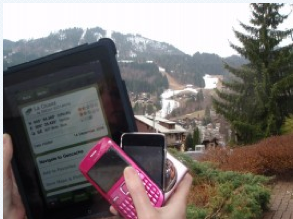 In March 2011, I was funded by the ESRC and StellarNet to attend the Alpine Rendez-Vous 2011 workshop, Methods and Models of Next Generation Technology Enhanced Learning. There we worked together to identify the current Grand Challenges for technology enhanced learning (TEL), which we brought together in a White Paper. Mwanza-Simwami , Daisy; Kukulska-Hulme, Agnes; Clough, Gill; Whitelock, Denise; Ferguson, Rebecca and Sharples, Mike (2011). Methods and models of next generation technology enhanced learning – White Paper. Compiled at: Alpine Rendezvous 2011, 28-29 March 2011, La Clusaz, France. For me, one of the Grand Challenges relates to learning analytics and assessment. Open, social TEL environments have made new models of learning possible. Learners now draw upon many different people and mediating artefacts, knowledge is dispersed and distributed, individuals may move rapidly between the roles of teacher and learner, and their collaborations extend across time and space. These new models of learning are ill served by a reliance on summative assessment of individuals. TEL environments also offer new resources in the form of the data they record – learners’ demographics, activities, interactions, participation and engagement – little of which is currently harnessed to support assessment. We need to develop ethical frameworks and learning analytics that will enable us to change our assessment practices to support learning in these new educational environments. This entry was posted on January 8, 2012, 10:13 pm and is filed under Analytics, Events, Funding, Papers. You can follow any responses to this entry through RSS 2.0. You can leave a response, or trackback from your own site. In addition to the White Paper, I co-authored an article on social learning analytics as a result of this workshop.